i thought hadwash was to make your hands clean? A story in which not so very much happens, short and straightforward - one of those where you feel you must have missed something. What I liked about it was the way it wasn't another story of mad scientists doing bad things for which they are unrepentant, and the Doctor is very respectful and supportive to a scientist who has made a terrible error for which she takes responsibility.It's a nice concept - trying to make a basic household product fulfil another function to give it a market edge and the impact is interesting and measured (though no less tragic for that)I'm not too sure about the narration by Meera Syal - it never quite seems to hit the spot if someone who has not been involved with the TV series reads the audiobooks and to have such a recognisable voice was a tad distracting although she did read in an accessible way. This story is dumb and confused even by Dr. Who standards - So an alien cat woman has cloned meme-spawn a micro-organism that travel through space collecting languages. She has turned them into hand-wash and is marketing them as hand-wash that makes the user into an omniglot - WTF?? since when have you been able to lean languages through using hand wash? The story also seems to have no concept of what a virus is - we get random terms bandied about and the entity changes from being a virus to a starfish like alien... sorry but random mutation just does not cut it as an explanation. The scientist has of course only tested the hand wash on her own species not humans, but is suitably repentant when it has an adverse effect on people. The Doctor - Matt Smith, and Amy Pond have to try and sort everything out.Ugh!!!! This is the most ludicrous DW story EVER - its a confused mess much of which makes absolutely no sense and the payoff really isn't worth it. On the plus side I did like the infected humans repeating 'listen to me' and then vomiting up starfish aliens - admittedly that was creepy - served no purpose, but was quite cool.The only reason this gets 2 stars rather than one, which the poor story deserves, is the marvellous narration by Meera Syal - she's lively, does lots of different accents and does an amazing job to make this stinker actually listenable. A very typical story of science gone wrong and an evil and stupid corporation that gets in the Doctor's way of saving people. It's a store we've seen/heard hundreds of times before, though with far less effort. It's a slow moving base under siege tale that's mostly utterly predictable, except the way the Eleventh Doctor is written is a bit off and a lack of effort in making any of the guest characters interesting or original. There was even the evil sadistic American military officer with "muscle" in his surname.I will say the nature of the cotangent was actually pretty inventive, and there were a couple slightly amusing moments at the very end. Otherwise, this book is imminently skippable. A fun, fast listen on a boring journey. This one is narrated by Meera Syal, who was the scientist in the TV episodes about the hole in the ground that brought humans back into contact with the Silurians. She does quite a good job differentiating the characters with a variety of voices, though her Amy Pond Scottish accent is only marginally better than Matt Smith's on a previous listen, which was hopeless. I see some reviewers here complaining about the lack of originality of the story, but I think followers of cult series generally like a certain formula and that this makes it inevitable the stories will follow a pattern. In any case, I think Doctor Who writers do quite a good job of making quite ordinary things scary. I never walk through a churchyard with statues without thinking about the Weeping Angels, or past a clothes shop window display without remembering the Autons. Now when I wash my hand, I'll wonder if I'll end up speaking French. Oh... I can already speak French, never mind.I find if you don't expect too much, these Doctor Who audiobooks are a bit of fun, better than listening to the radio on car journeys because the programmes that are on when I travel are usually ones I'd never listen to if I was at home. Another fast adventure. The Doctor and Amy land on a cargo ship 100 years in Earth's future. It's heading from the planet Vinsk to Earth with a huge supply of amazing handwash which supposedly grants the user the ability to speak any and all languages in the universe. The problem? It was never actually tested on humans and when one worker sneaks a sample things spiral into the sort of hectic Save The World dash usual with the Doctor. The reader was good and carried the thin plot well enough to listen to it all and end feeling like it was at least entertaining. Still, plenty of plot holes and odd moments to get past. Most new Doctor Who audio adventures are fun, fast-paced, and unmemorable. Their short length combined with their perplexing multitude of characters and silly plots make them difficult to distinguish. This adventure by Jason Arnopp certainly fits all of the above. The plot is contrived: a soap somehow makes humans try to speak every language in the universe? There are too many identical characters, and the book was over in a flash! Having said all that, Meera Syal's reading made it worthwhile to hear. She does the character voices well, and she reads with such vigor and energy that you can really tell she's having a good time. Pour info, Amy finit bien par parler français dans le livre - sauf que tu coup, c'est techniquement Meera Syal qui parle français. Et elle le parle vachement bien.Rien de violemment original dans cet audio très "monster of the week" donc mais il reste sympa pour occuper un trajet à pied ou en transports.J'ai particulièrement aimé Meera Syal en narratrice, notamment son Amy: que ce soit dans le ton ou dans l'écriture j'ai vraiment eu l'impression d'entendre Amy Pond. Avec le petit accent tout cute et le côté tête brûlée, tout y était, vraiment. No-one does the "monster of the week"-storyline better than Doctor Who, which makes it very sad to see some all-too obvious and uninspired variations on that theme emerging from the franchise. "The Gemini Contagion" uses every cliché it can find as it carries the extremely predictable plot through the standard motions. It'n not awful on any level, but there is nothing fresh or new about it either. 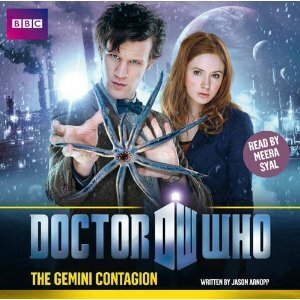 The new Eleventh Doctor audiobook, a story by Jason Arnopp read by Meera Syal, featuring Eleven and Amy dealing with some dubious nanotech-like entities (or "sentient micro-organisms" if you prefer). The usual good fun; Meera Syal's Amy sounds a bit Ulster at first but settles down, and her portrayal of the lead supporting character, an alien scientist called Korn Palloa, is very good indeed. Definitely worth getting hold of. The story was a decent enough 11 and Amy adventure. A corporate scientist invents a hand gel that allows beings to speak every known language, but it goes awry. The best part of this 60 min BBC audio was the voice work by comedienne, playwright, and actress Meera Syal. Syal is known to Whovians as Nasreen Chaudhry in series 5's The Hungry Earth/Cold Blood. Very enjoyable, seemed very short but still ultimately satisfying. The narrator was very good, she really captured the personalities and accents of both the Doctor and Amy. Also the voices she used for other characters were really well done.A simple plot but still interesting.A good dose of horror and humor. Another short audio-story featuring the 11th Doctor and Amy Pond. It was full of adventure and suspense. The narrator is fantastic! She handled multiple accents and characters extremely well. It's worth listening too just for her superb reading skills. Another book I would recommend to Doctor Who fans. Even non-Doctor Who fans would probably enjoy this. I liked this story, but I didn't love it. At one point I was a little lost and had to go back and listen again. I think the story was great, but just way to short for me. Jason Arnopp Meera Syal - Jason Arnopp is the author of The Last Days Of Jack Sparks (Orbit Books), which is now in movie development at Ron Howard's Imagine Entertainment.Arnopp wrote the Lionsgate horror feature film Stormhouse, the New Line Cinema novel Friday The 13th: Hate-Kill-Repeat, various official Doctor Who works of fiction (including the BBC audiobook Doctor Who: The Gemini Contagion) and script-edited the 2012 Peter Mullan film The Man Inside. Arnopp has also written 2012's Beast In The Basement, a horror novella available at , and experimental ghost story A Sincere Warning About The Entity In Your Home.He is the author of non-fiction ebook How To Interview Doctor Who, Ozzy Osbourne And Everyone Else. He is on Twitter here, and is represented by literary agent Oli Munson at The AM Heath Agency. He is also represented for film and TV by Lawrence Mattis at Circle Of Confusion.